not injured through foreign objects thrown from the machine. from the machine when operating. of severing toes or fingers. given supervision or instruction concerning use of the machine by a person responsible for their safety. other people or their property. blades and bolts to preserve balance. Mow only in daylight or in good artificial light. safety devices, for example deflectors and/or grass catchers in place. Working on banks can be dangerous. – Mow across the face of slopes – never up and down. Never mow by pulling the mower towards you. position before returning the machine to the ground. Do not put hands or feet near or under rotating parts. zone when operating the machine. result in increased noise and vibration. – Whenever you leave the machine. – If the machine starts to vibrate abnormally (check immediately). would be actuated by a 30 mA residual current. the types indicated by the manufacturer. lead, otherwise it may be damaged. against splashed water. The connection must not be in water. 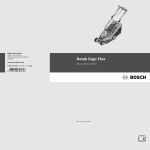 Bosch Service Centre for details. of watertight construction and intended for outdoor use. your RCD every time you use it. be used with a cable strain relief. used if in perfect condition. worn or damaged parts for safety. the right type are used. clean and free from debries, if necessary clean with a soft, dry brush. The garden product is intended for domestic lawnmowing. The values given are valid for a nominal voltage [U] of 230 V. For different voltages and models for specific countries, these values can vary. Please observe the article number on the type plate of your garden product. The trade names of the individual garden products may vary. Starting cycles generate brief voltage drops. Interference with other equipment/machines may occur in case of unfavourable mains system conditions. Malfunctions are not to be expected for system impedances below 0.36 ohm. Sound emission values determined according to EN 60335-2-77.
standards: EN 60335-1, EN 60335-2-77.
the collection of a product in need of servicing or repair. Do not dispose of garden products into household waste!